As part of a new series of articles we will take a look at technology that was predicted in films and where they are today. So do we have replicator technology today? If we use the definition shown above then then answer would be NO, however we are not going to use that definition. Instead we are going to use what we know today as a basis for our answer. Over the last few years 3D Printer Technology has exploded with printers becoming cheaper and the range of materials that can be used expanding. SpaceX and NASA have both produced Rocket Engine parts using 3D Printer technology both of which have been tested to extreme temperatures. 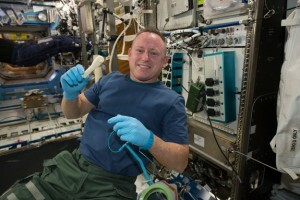 International Space Station Commander Barry “Butch” Wilmore shows off a ratchet wrench made with a 3D printer aboard the orbiting lab. The wrench and other parts will return to Earth for comparison with ground samples in early 2015. During the SpaceX CRS-4 mission to the International Space Station earlier this year the first 3D Printer in space was delivered and later installed. While at present this is just a test environment a second more capable printer is already scheduled to be delivered some time in 2015 with an ESA printer also joining it on the station. During the testing on the space station NASA emailed the design for a wrench which was then printed. Natural Machines has announced a 3D Food Printer and NASA are also looking into this for future space missions, at the moment this is just a research project but could well be used on long duration missions in the future. Therefore while we do not currently have the replicators described in Star Trek we do have the ability to replicate items using an increasing array of materials and as we invest more time and money into the technology that will continue to expand.